Published on February 27, 2009 in Bands/Artists, Music and Vinyl. 0 Comments Tags: "thrill jockey", CD, Eleventh Dream Day, Freakwater, Hidden Agenda Records, mp3, Parasol Records, The Cathmawr Yards, The Horse's Ha, The Zincs, upcoming album, Vinyl. 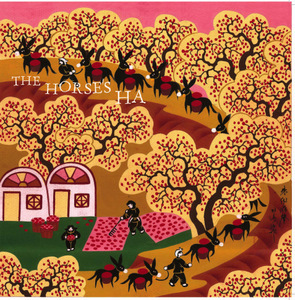 The oddly-named The Horse’s Ha is a cross-section of legendary Thrill Jockey and Chicago bands. Formed in 2002 as a side project for Freakwater and Eleventh Dream Day member Janet Beveridge Bean and James Elkington of The Zincs. Initially, they were going to focus on covers but over the next couple of years Elkington started writing songs specificically for them to perform as The Horse’s Ha. The band is made up of Bean, Elkington, Nick Macri (also of the Zincs and a bunch of other bands) on bass, Charles Rumback on drums and Fred Lonberg-Holm on cello, who– along with Bean– helped out on the first Zincs record Dimmer in 2005. Mark Greenberg from the Coctails worked on Dimmer as well as The Horse’s Ha’s new record titled The Cathmawr Yards. The band’s name as well as the title of the album come from a Dylan Thomas short story “The Horse’s Ha” where zombies apparently inhabit the fictional Welsh graveyard of The Cathmawr Yards. Listening to the six songs streaming from their MySpace page, the band has a pleasant folksy acoustic sound with Bean and Elkington providing very complimentary vocal harmonies. The Horse’s Ha is pretty much the intersection of Freakwater and the Zincs, which is a good thing. The Cathmawr Yards will be released on June 9th as CD and download by Parasol Records label Hidden Agenda. This will be followed by a vinyl release. Hidden Agenda, according to the Parasol website was a label designed in 1997 specifically to release one-off CD’s and singles for higher-profile artists. Although, when you look at the catalog it is clear that some of these artists have released more than one title on the label, so maybe we’ll see future releases from The Horse’s Ha. No confirmation of a tour, but I’d like to see this lineup. The Time to play b-sides archives for the eleventh-dream-day tag.